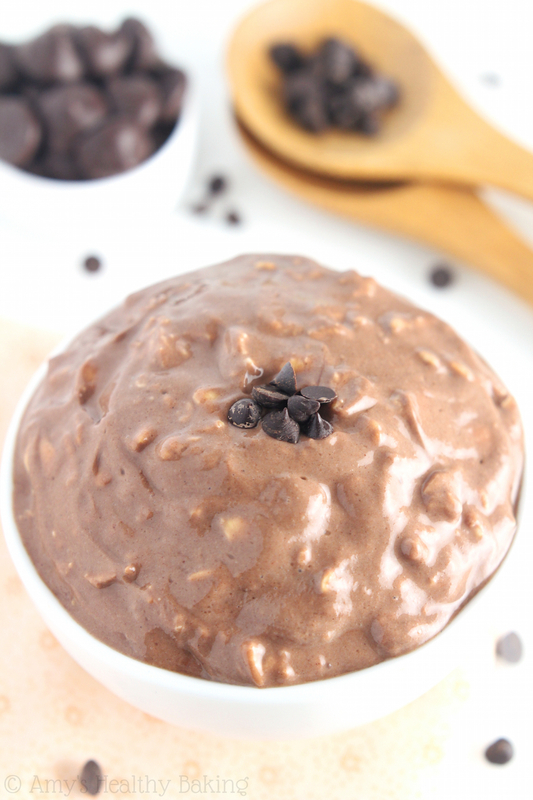 Thick, creamy oatmeal that tastes like dessert for breakfast! 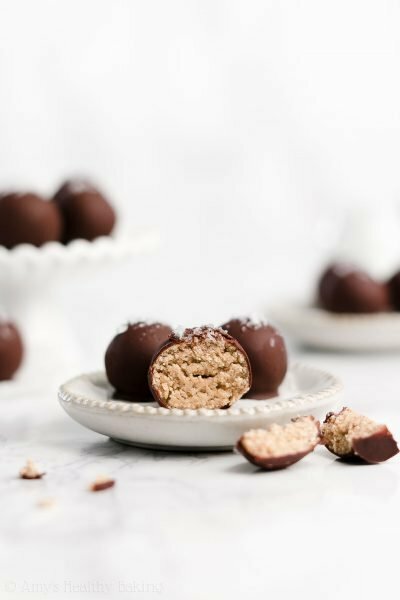 Made with just 5 healthy, everyday ingredients. It’s one of the easiest meals you’ll ever make! Every so often during my early childhood years, my family drove a few towns north to eat Sunday brunch at Marie Callendar’s after church. Although my parents preferred restaurants a little closer to our house, my brother and I would nearly beg to go at least once each year because of the kid-friendly buffet option. After a waitress seated us at a table and scribbled down drink orders, my brother and I made a beeline for the long tables laden with platters and chafing dishes. We doled out a few strawberries and slices of melon onto our plates, the obligatory “healthy” part to satisfy Mom, before heading down the line to the waffles. Unlike traditional or even Belgian-style waffles, Marie Callendar’s made theirs a little differently. Their waffles looked like long boats: rectangular in shape with a deep, sunken cavity in the center. Those waffles were the perfect vessels for the wide range of toppings that the kitchen set out! Although we should have selected the variety of fresh fruit with just a dollop of pure maple syrup… What little kid with a huge sweet tooth does that? Instead, we piled on the gummy bears, mini M&Ms, and whipped cream until our plates appeared as if they belonged in a college dining hall or dessert buffet! But now I can! 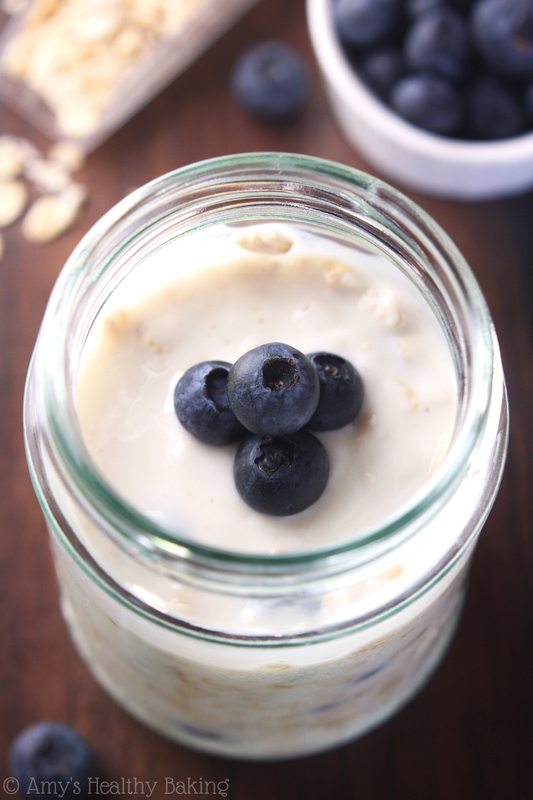 Albeit a slightly healthier version of “pie…” These Blueberry Pie Protein Overnight Oats have the same sweet flavor as the iconic dessert, but they contain no refined ingredients (including sugar!) and are packed with over 16 grams of protein instead. My sweet tooth and my waistline end up satisfied! 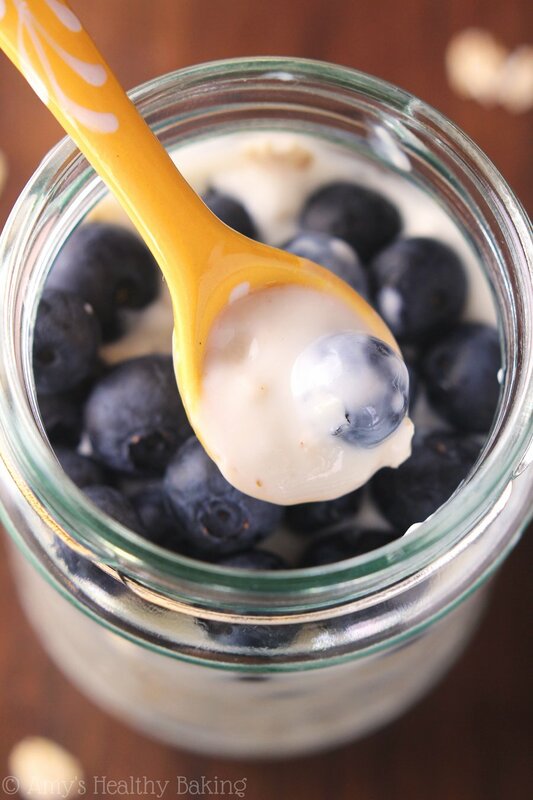 This clean-eating breakfast is so easy to make that it probably shouldn’t even be called a recipe… Just 5 healthy, everyday ingredients mixed together, covered and chilled overnight, and eaten straight from the jar with a spoon. If only every meal could be that easy to make! Note: Overnight oats are meant to be eaten cold. No need to heat them up! That’s the beauty of leaving the oats soaking in the fridge overnight: they turn as soft as if you had cooked them on the stove. Much easier than watching and stirring the hot pot! The big protein boost comes from Greek yogurt. Surprise, surprise… By now, I’m sure you all know how much I adore this stuff! 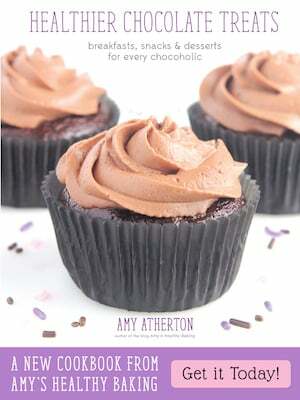 I use it in nearly every baking recipe—from muffins to cakes to frosting and more—because it’s so healthy and versatile. One cup of Greek yogurt has 21 grams of protein, which is 3-4 times what regular yogurt offers! I tossed in fresh blueberries because it’s summer and I’m swimming in them, but frozen would work fine too. Especially during the off-season when frozen berries are much cheaper! I like to squash the blueberries a little bit with my spoon and stir the juices in with the rest of the oats so every bite tastes just like the pie. And dessert for breakfast is always a huge hit at our house! 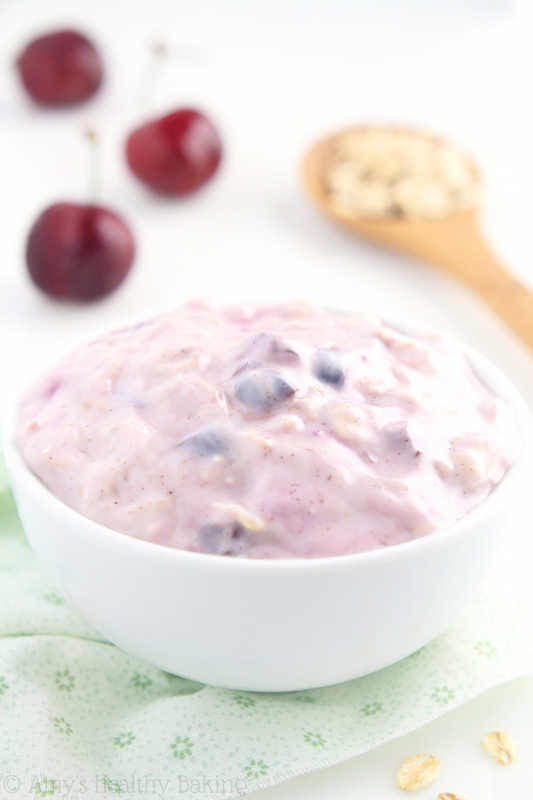 These thick, creamy oats practically taste like a slice of pie for breakfast! This recipe is easily doubled, tripled, or quadrupled to serve more. The oats will stay fresh if stored in an airtight container in the refrigerator for up to 5 days. Add all of the ingredients to a mason jar or plastic container with a tight-fitting lid. Stir until thoroughly combined. Cover and chill for 8 hours, or overnight. Serve cold. Notes: Any milk may be substituted in place of the nonfat milk. Fresh or frozen blueberries may be used. If using frozen, I highly recommend the smaller wild blueberries, if you can find them. I love these oats! I use honey non fat Greek yogurt and that helps sweeten it as well. How many grams would you say makes up the whole bowl? I’m so glad you’re enjoying the oats Claudia! I haven’t weighed the entire jar before, so I’m not entirely sure. It should be fairly easy for you to calculate though! 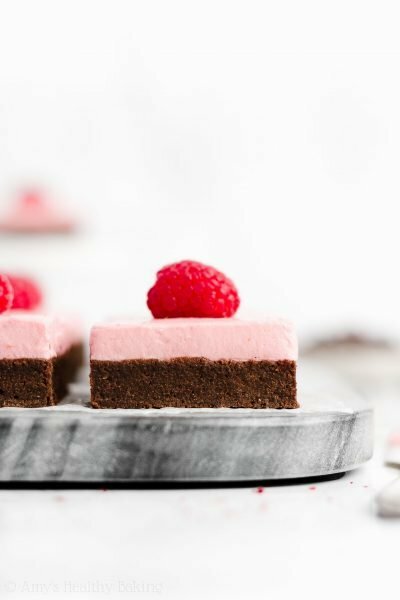 I just tried this recipe last night, and it was delicious and creamy! 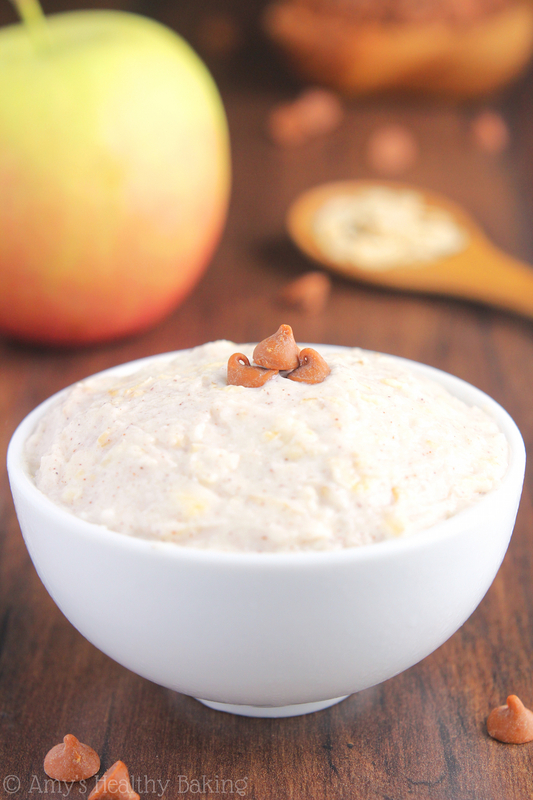 My husband wants to try a less creamy version, so I am excited to check out some of your other overnight oat recipes. Fiber and protein are definitely important to us, and the ease of this recipe is fantastic! I’m so glad you enjoyed the oats Ili! Fiber and protein are really important to me too. 🙂 I can’t wait to hear what recipe you try next! 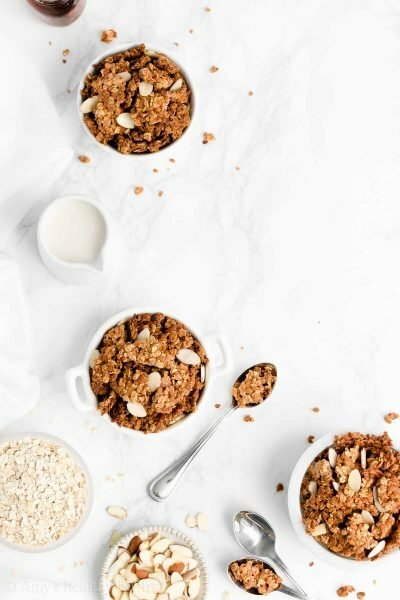 Could I substitute additional milk-like products for the yogurt (rice milk, probably)? If so, would you recommend the same or less rice milk than the amount of yogurt? Yes! If substituting rice milk for the Greek yogurt, only use half of the amount. I hope you enjoy the oats Rebekah! 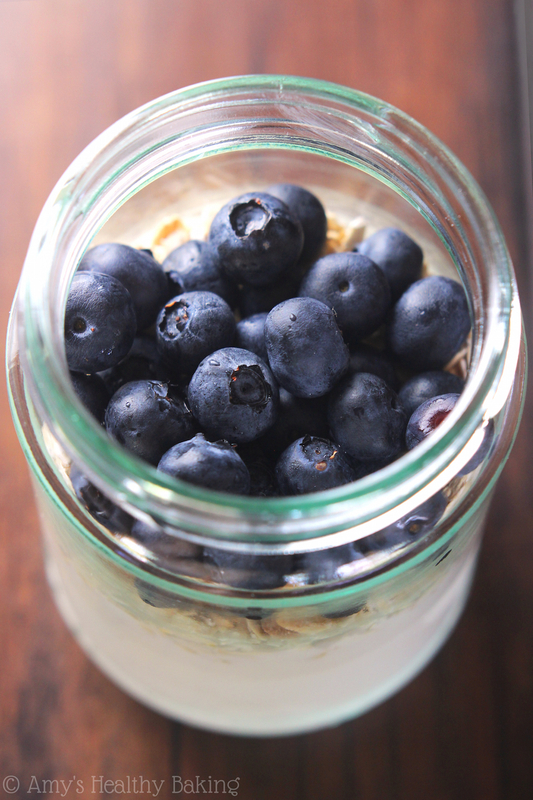 I love overnight oats and since there are always blueberries in the refrigerator I thought I’d try this one! But it’s been a long time I had such a delcious and healthy breakfast! I’ll make overnight oats more often now, it’s so easy and soo good :). I’m so glad you enjoyed the overnight oats Karen! Your refrigerator sounds just like mine… We always have fresh blueberries too (and sometimes some other berries)! That’s really sweet of your mother to buy you chia seeds — what a sweet lady she must be! Hi! Can I omit the Greek yogurt and use a scoop of protein instead ? Not quite! 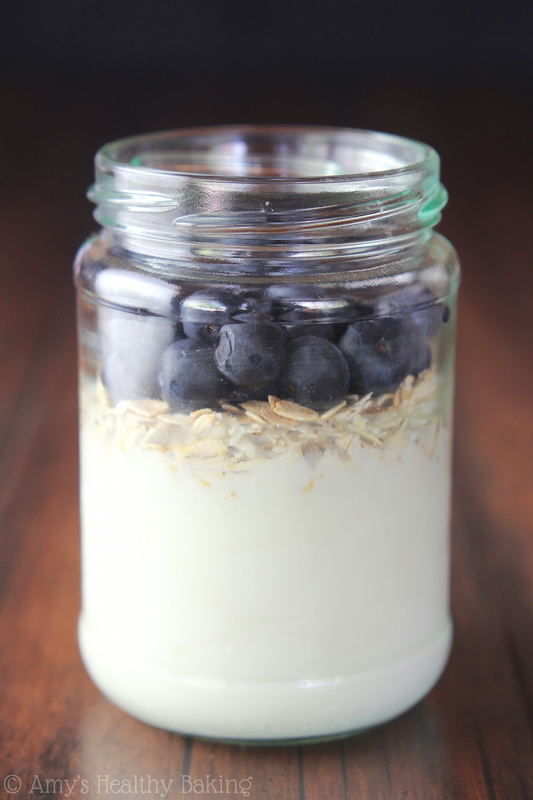 The Greek yogurt also adds moisture to the oats, which dry protein powder does not. If you’d like to omit the Greek yogurt and use protein powder instead, then use double the amount of milk. 🙂 I’m excited to hear what you think of the oats Cheri! I really appreciate your interest in my recipe Jamie! I don’t recommend omitting the sweetener entirely because the oats will taste rather tart with plain nonfat Greek yogurt. However, you can sub your preferred sweetener — any kind will work! 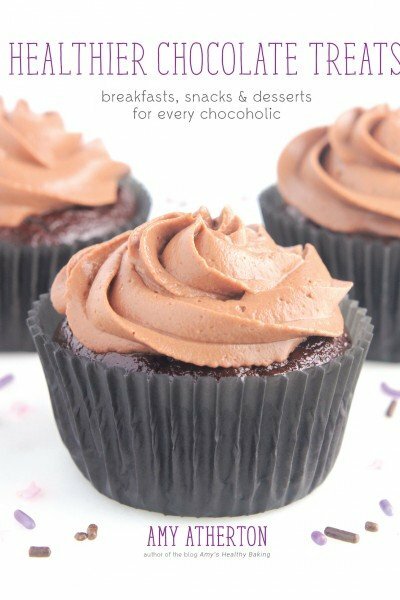 You’ll want the equivalent of 2-3 teaspoons of granulated sugar. 🙂 I can’t wait to hear what you think of these overnight oats! I used one that holds between 1½ to 2 cups of liquid! 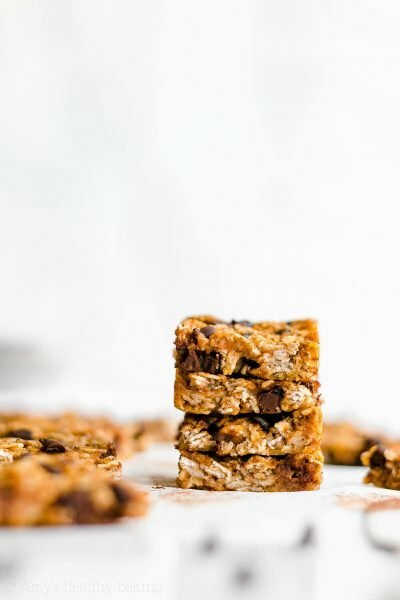 🙂 I can’t wait to hear what you think of these oats Amy! Hi Amy! 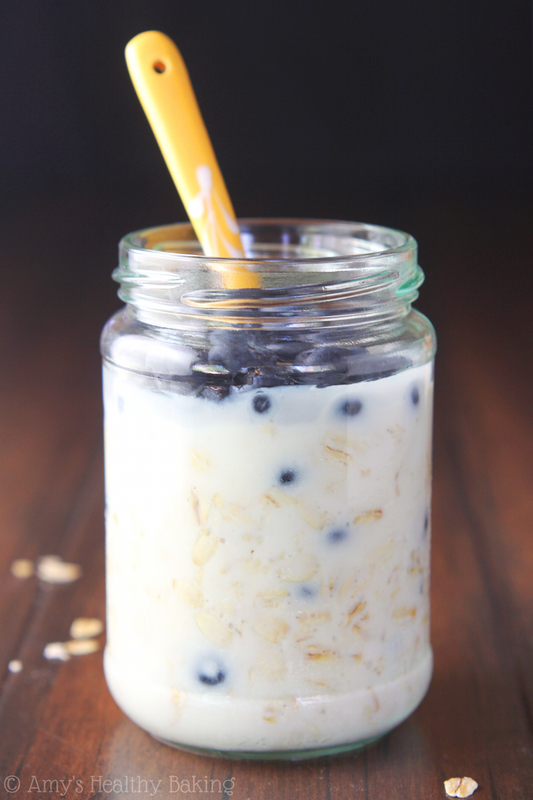 I’ve been wanting to try overnight oats and finally did with your recipe-it’s delicious! I can’t wait to try out more items from your blog! 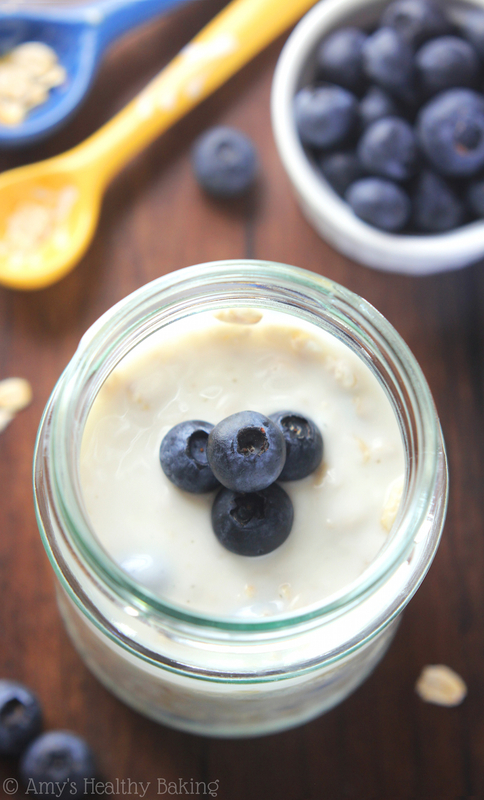 I’m so glad you loved these overnight oats Andrea! I’m truly honored that you decided to use my recipe as your first time trying overnight oats — that means a lot to me! 🙂 In case you’re interested, you can find all of my overnight oats recipes here!